Please note that the unit to be installed can be mounted flush left or flush right, but not center. These kits are most often used on LA3A’s and LA4’s, but they also work on UREI graphic EQ’s, the UREI Digital Metronome, etc. All parts are anodized black. 1. One flush 3.5” rack ear. 2. One extended 3.5” rack ear. 3. 2 spacer bars with screws and washers, for installing the rack ears. Please note: on these UA kits, the side holes in the rack ears and the small spacer plates are slightly farther apart than the holes on original UREI gear. However, the rack kit will work fine, and it will look perfectly normal after assembly. Beneath the photo of the kit is a picture that shows how the kit looks after being installed on an LA4. Needless to say, no LA4 is included with this kit. 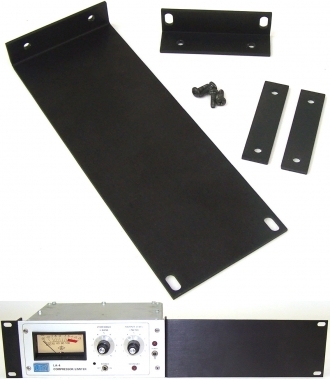 We also sell dual UREI rack mount kits, in black and silver. Please check our store listings for this item. Studio Electronics has offering expert factory trained service for ALL UREI equipment for 25 years. We work on LA2A’s, LA3A’a, LA4’s, 1176’s, 1178’s, and every other UREI product. We stock replacement T4B’s, LA2A AND LA3A transformers, meters, pots, switches, 4-section can type capacitors, and many other hard to find parts. Please email us with any questions, and thanks for looking!